A woman is in hospital with severe burning after suffering a horrific attack in which a stranger viciously threw sulphuric acid over her. The unnamed woman was drenched in the corrosive liquid as she walked into a San Diego laundromat on Saturday, causing second degree burns to her arms and back. Her attacker has been named by police as 55-year-old Arturo Jose Reyes. He was arrested about 20 minutes after the 6am attack in his dark blue BMW at a nearby gas station, where he was making a disturbance. The woman positively identified Reyes as her assailant, telling police that she had never met him prior to the attack. Click link above to read full story..
Actual murder took place in October, 2010. Relaxing with his girlfriend, he looks the picture of innocence. 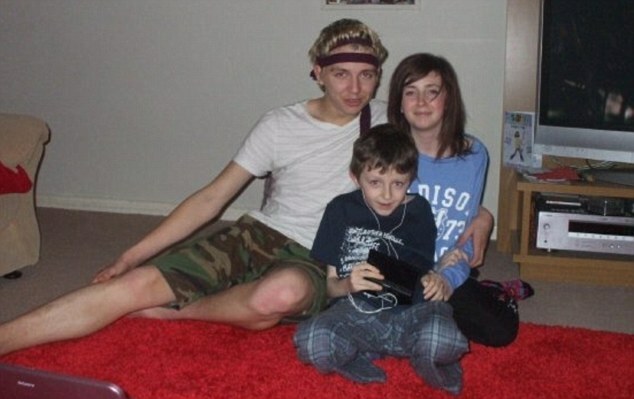 Yet not long after this picture was taken with Rebecca Aylward, Joshua Davies battered her to death. 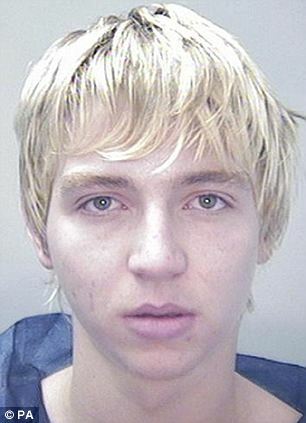 Davies, 16, lured his ex-girlfriend to a secluded spot where he killed her to win a bet over a free breakfast. Rebecca, 15, and her mother Sonia had both been delighted when Davies, an academically gifted boy from a churchgoing family, arranged to meet her again. When her daughter failed to come home, Mrs Aylward’s reaction was to tell her sister not to worry adding: ‘She’s safe, she’s with Josh’. By that time Rebecca had been bludgeoned with a rock the size of a rugby ball – and Davies was trying to cover his tracks on Facebook. He failed – and was yesterday found guilty of murder. The chilling case highlighted how he used the internet, text messages and an array of social networking sites to plot her death. A few weeks before the murder, one of his friends had joked that he would ‘buy him breakfast’ if he carried out his threat. Mr Justice Lloyd Jones lifted an order preventing the killer from being named and photographed, saying it was in the public interest that he should be identified. 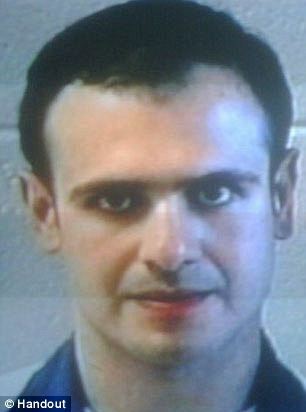 Pictured above; Killer, Joshua Davies. Police mugshot of Davies above, and Rebecca right below Davies. Rebecca’s mother Sonia had both been delighted when Davies, an academically gifted boy from a churchgoing family, arranged to meet her again. 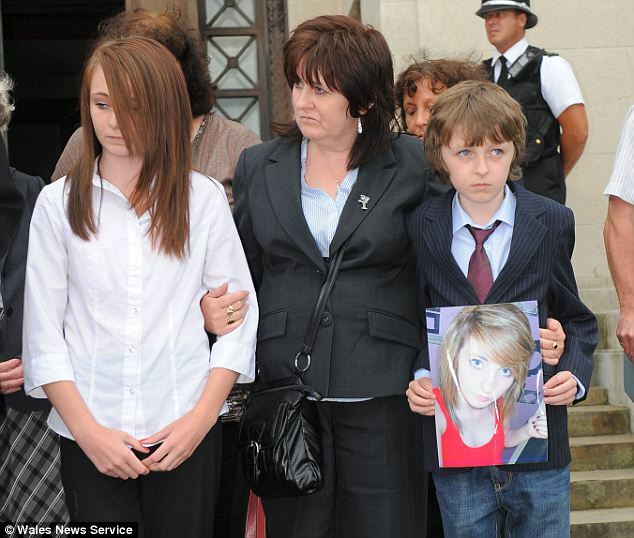 And Rebecca’s family issued a statement at Swansea Crown Court saying their lives had ‘stopped’ on the day in October 2010 when she was murdered. 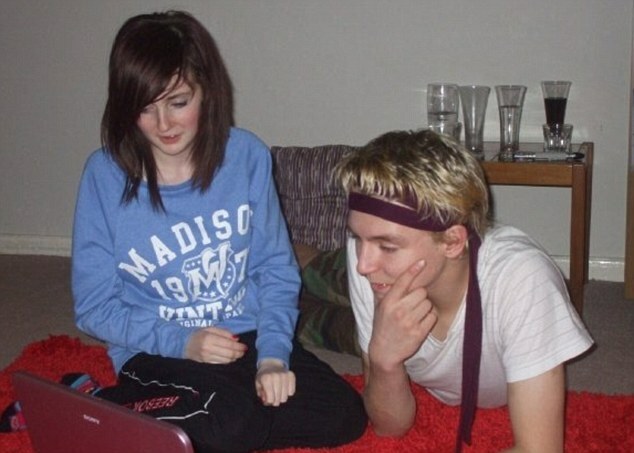 Rebecca and Davies, from Aberkenfig, near Bridgend, met at the age of 11 and began going out together in late 2009 but the relationship soured and was ended by Rebecca after three months. The following October he asked to see her again. 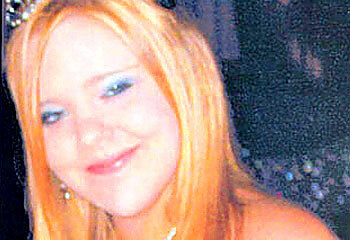 ‘Rebecca was quite happy to meet up with him – she thought he was going to ask her back out,’ her mother told the court. 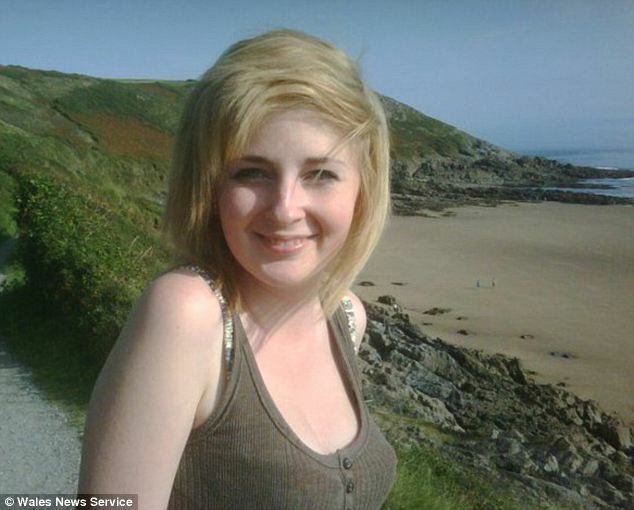 When the couple were alone, 6ft Davies repeatedly slammed a rock into Rebecca’s head before leaving her bloodied and battered body face-down on a wet forest floor. He then took a friend, who cannot be named for legal reasons, to the scene to show him her body. Davies told him: ‘Do you know how hard it is to break someone’s neck? She was facing away from me and I thought, “This is it, I’m going to go for it”. He then updated his Facebook page saying he was at home at the time of the murder, and after Rebecca had been reported missing even expressed his own fears for her welfare. He then made plans to return to the forest near his home on the night of the murder to bury Rebecca’s body and even attempted to pin the blame on the friend he led to the scene, using it as his defence during the trial. 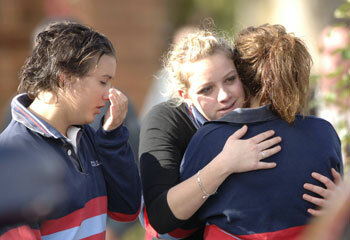 Police were alerted to the killing after one of Davies’s friends told his parents and led officers to the body. Other friends told detectives that Davies was a ‘Jekyll and Hyde’ character who was ‘fixated’ on murder and would threaten to kill anyone who crossed him. They said that most of the time, Davies, who lived with his shop assistant mother Hayley and mechanic father Steven, was a confident and outgoing schoolboy in all the top sets who dreamed of becoming Prime Minister. But he also had a ‘dark and sinister’ side that would surface when he fell out with people and was extremely ‘jealous and possessive’ of Rebecca. Shortly after she ended their relationship he began spreading vicious rumours about her having an abortion and trying to get pregnant to keep him following the break-up. He would share his threats and scheming with his friends on social networking sites and over text messaging, using textspeak to communicate. The jury were given a list of text sayings and symbols to help them understand the conversations between the teenagers. Davies was obsessed with violent films and his Bebo page lists his favourites, including ‘There Will Be Blood,’ in which Daniel Day-Lewis bludgeons a man to death with a bowling pin. He also told friends he was going to drown Rebecca in a river or throw her off a cliff and dump her body in a hole, inspired by the violent Spartan fantasy film 300. He even bought a toxic foxglove concoction that he said he was going to put in her drink so she would ‘die in her own filth’. But despite all the warning signs, none of his friends believed he would actually carry out his threats. Lifting an order preventing Davies being named and pictured because of his age, Mr Justice Lloyd Jones said: ‘This is a crime in a small and closely-knit community and it’s right that the public should know there has been a conviction and who has been convicted. Joshua Davies and his teenage friends inhabited their own online world in which the line between fiction and reality often became blurred. They would use textspeak, jargon and symbols in a language so impenetrable that the jury had to be given translations. The apparently playful way in which the schoolchildren communicated – in sentences peppered with smiley faces and symbols – belied the sinister nature of Davies’s intentions. 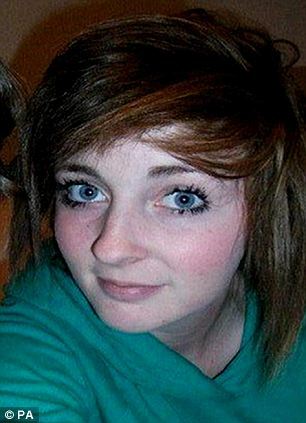 In the months and weeks leading up to Rebecca’s murder, he would post messages on social networking sites including Facebook, MSN Messenger and Bebo, saying he wanted to kill Rebecca. His friends would respond to these sickening threats in jest, often egging him on in the mistaken belief that he was messing around. But Davies was deadly serious and continued sending the messages until just days before he battered her to death in a woodland clearing. The text finishes with a smiley face symbol. The friend, who cannot be named for legal reasons, said in court that he did not believe Davies and had not known how his texts would be taken, suggesting an extraordinary disconnect between the online world and reality. ‘I didn’t mean I wanted him to kill her,’ he said. ‘I thought he was only joking so I was messing about with him. Davies posted Facebook updates saying he was ‘just chilling with my two friends’ while watching Strictly Come Dancing to imply he was at home at the time the murder took place. He later posted the Facebook status update: ‘I enjoyed a rather good day and a lovely breakfast’, in a clear reference to the bet he had made with his friend. And he posted his own concerned messages on Facebook after Rebecca was reported missing, suggesting he was genuinely worried and giving her family no cause to suspect he was involved. ‘I feel sorry for her mother,’ the murderer wrote on Facebook. Jesse Dimmick (pictured above) attempted to seek $235,000 in damages from Jared and Lindsay Rowley of Kansas over what he says is a ”breach of contract.” He claims that the newlyweds, whom he held hostage at knife point during a home invasion in 2009 at the couples Topeka home, had agreed to hide him from police (who wanted him over a murder charge in Colorado) in return for a sum of money. Dimmick was eating the couples food and watching Patch Adams he fell asleep, and the couple used that moment to escape and call police. Dimmick’s defense was that he and the couple had an ”oral agreement” and the couple broke that agreement. As a result of the plaintiffs breech (sic) of contract, I, the defendant suffered a gunshot to my back, which almost killed me. The hospital bills alone are in excess of $160,000, which I have no way to pay. Dimmick was charged with and convicted of four felonies, including kidnapping. He is currently also being held on one charge of murder. The couple has stated that they never accepted any money from Dimmick. He has also been sentenced to 11 years in connection to the September, 2009 beating death of a Colorado man. A year and a half ago Elizabeth Holloway, moved in with her mother, her mother’s boyfriend and half sister and brother. A year and a half ago, Elizabeth began being abused by her mother. A year and a half ago, Elizabeth was 7 and ½ years old and had no idea that by 9-years-old she’d be telling her younger sister she was dying…. and would. Imagine you are 7 and ½ years old and you are moving in with your mother and siblings, exciting right? It’s a new start that includes a sister and a brother, what could be bad about that? I’ll tell you what could be bad about that… a mother that reportedly begins to beat you as soon as you move in. According to police reports Elizabeth lived with her father until 17 months ago when she moved in with her mother Crystal Cardenas (25). At which time it appears she became her mother’s personal punching bag enduring numerous incidents of abuse. In the 17 months she lived with her mother she was reportedly choked, punched, kicked, burned and thrown to the ground. Poor thing, I just want to hug her so bad! A few days before her death on January 17th, Crystal reportedly punched and kicked Elizabeth, causing a bruised pancreas and transection of her intestines. These injuries would have resulted in Elizabeth dying “a very slow and painful death,” according to prosecutors. Elizabeth experienced vomiting and loss of feeling in her lower extremities. She told her 7-year-old half sister she felt like she was going to die. Now that statement right there just does it for me, I can not imagine the fear she must have felt at 9-years-old and literally thinking she was going to die and having NO ONE to go to. This little girl knew she was dying… it breaks my heart! Pictured; Crystal Cardenas, 25, setenced to 15 month’s to life in prison. On January 17th San Diego Police were called at approximately 10:00 pm with a report of a child not breathing. Paramedics arrived and took Elizabeth to the trauma center; she died at 11:56 pm. The SDPD child abuse unit was originally handling her case, but the autopsy showed she died from blunt force trauma and the case was handed over to homicide. After a thorough investigation, that included interviewing the family, extended family, neighbors, former neighbors and people at the school Elizabeth attended, the DA’s office and SDPD concluded that Elizabeth’s mother Crystal was the one who inflicted the abuse and caused the death of her daughter. Cardenas’ other two children are under the care of CPS. Cardenas faces 25 years to life, if convicted of murder. The preliminary hearing is set for February 16th. Click here for the source of this article.